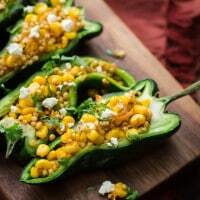 Sweet Corn Sorghum Stuffed Peppers | Naturally. Over the past three years, my patio garden has grown and evolved. I’ve learned so much and every year, I get a bit better at not killing things off. One of the toughest things is battling the hot, valley summer while trying to balance water conservation. This year I installed a drip system that works on a timer, but I’m still carefully monitoring everything (but the initial water bill was nearly half of what it was last year!) It’s both exciting and a bit nerve-wracking because it seems very easy to kill a plant off that was doing well only a week ago. That being said, I tend to have excellent luck with peppers. I have three plants, a sweet pepper plant, a shisito plant and a poblano plant (primarily to make stuffed peppers). If I had it my way, 90% of stuffed pepper recipes would be made using poblano (this also might be because I’m kind of in love with Chile Relleno). I love the unique flavor and the fact that you’re getting a chili pepper without the intensive heat of some. 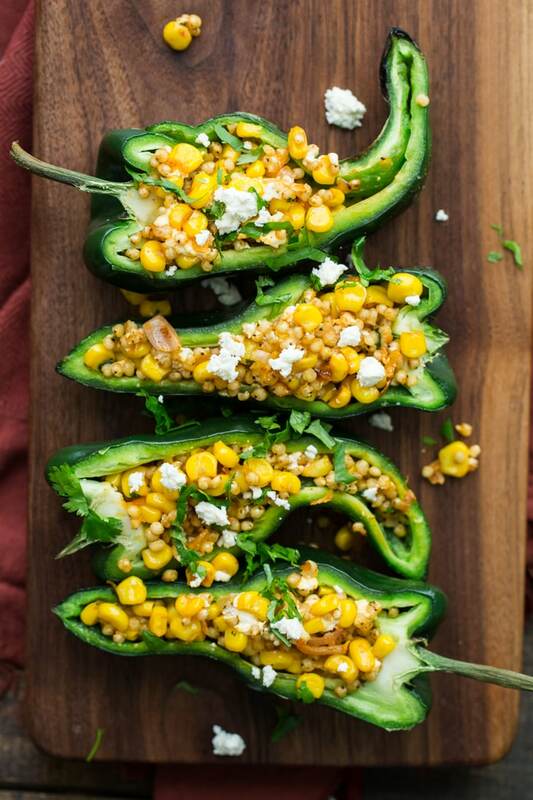 These stuffed peppers use one of my favorite stuffing grains: sorghum. Sorghum has such a nice, nutty texture and holds its own with the sweet corn. Of course, if you don’t want to wait for it to cook (it does take a bit longer) or can’t find it, quinoa is usually my second choice for a grain! Prepare poblanos by slicing in half and removing seeds if desired. If need be, slice a small piece off the bottom to allow peppers to sit flat. Heat a skillet over medium heat. Add onion and cook until translucent, 5 to 6 minutes. Stir in sweet corn and continue to cook for another 4 to 5 minutes, until sweet corn is soft. Add in sorghum, smoked paprika, salt, and pepper. Taste mixture an adjust seasonings as desired. Remove from heat and stir in goat cheese. Divide mixture among the peppers and when ready, light grill to medium heat. Grill peppers over direct heat until the pepper begins to blister. Transfer to indirect heat and continue to cook until mixture is hot and cheese has melted slightly. Serve with a sprinkle with extra cilantro and goat cheese. First off, great color combination, very summery! And don’t we just love cooking right from the garden? The mere thought already adds extra value and flavor, right? Great dish, Erin! This sounds just wonderful. 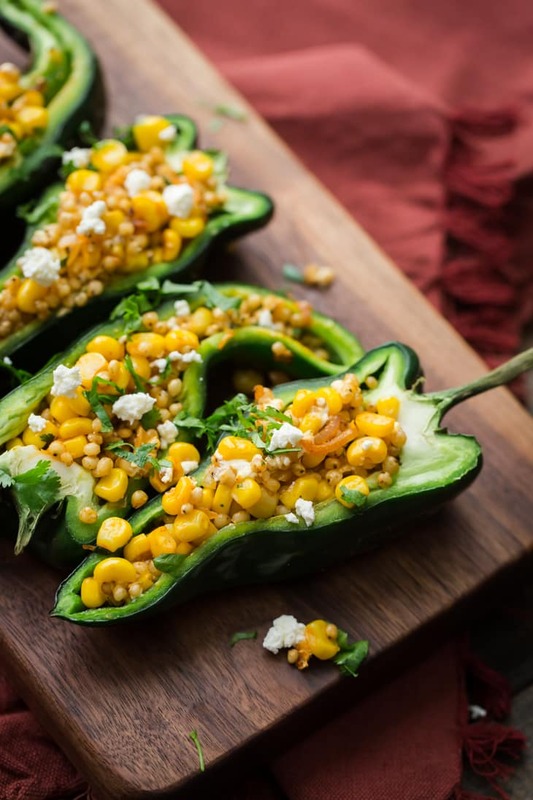 We’ve quit eating stuffed bell peppers because we no longer digest them well, but don’t seem to have a problem with poblanos, so this would be a great recipe for us to try. I’m not sure why it has never occurred to me to stuff poblanos – chile rellenos are among our favorite dishes, and since we live right on the border with Mexico, poblanos are readily available. I think a lot of possibilities just opened up. Thank you for that! Gah this makes me wish I hadn’t accidentally killed my pepper plant! Lovely recipe! I don’t like corn very much so I might substitute for chickpeas! these look delicious and so easy to veganize. I can’t wait to try them! Delish! I’m always looking for great new vegan and vegetarian food blogs. This was the first I’ve made from yours. I made the poblano crema (from cashews) to sub the goat cheese (crema recipe from the Love and Lemons site here https://www.loveandlemons.com/vegan-enchiladas-cashew-poblano-crema/), and used farro instead of sorghum because that’s what I had on hand. It was very yummy! I’ll be returning. Thank you Ella!